has been released on 15-March-2019. Interested candidates can submit application form online at TRB website www.trb.tn.nic.in before the closing date. Starting date of online form activation is 15-03-2019 and Last date for the receipt of applications is 05-04-2019. Date of TNTET written exam will be in April/May-2019 from 10 AM to 01 PM. 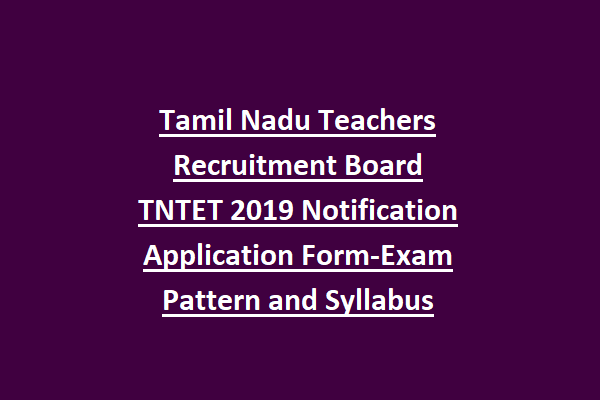 For more details like Application form procedure, written Exam date, Exam syllabus and pattern and other information regarding this TamilNadu Teachers Recruitment Board TRB Teacher Eligibility Test TNTET 2019 are mentioned below. TNTET application from available in Sales Counters from the date: 15-03-2019. Last date to for the receipt of applications: 15-04-2019 (by 05.00 PM). TNTET 2019 Written examination Date: Paper- I: April 2019 (10 Am- 01 PM). TNTET 2019 Paper II Examination date: April 2019 (10 AM- 01 PM). Paper I: Applicants must have passed Higher Secondary Course (10+2) and diploma in teacher education or Elementary education. Paper II: Applicants must have completed Bachelor’s Degree (BA/ BSC/ B Litt.) with English, Tamil, Mathematics, Chemistry, Physics, Botany, Zoology, Geography, History as major subjects or Degree with any one of the equivalent subjects. -Candidates appearing for D.E.ED Final year examination can also permitted to appear for Paper I, paper II in teacher eligibility test TNTET 2019. See the TN TRB official notification for more details. Application fee structure will be intimated later. See the notification for more details. Tamil Nadu TRB will conduct written examination to select candidates for teacher vacancies. TNTET Written exam consists of paper I and paper II. Paper I written Examination date: April 2019 (10 Am- 01 PM). Paper II written Examination date: April 2019 (10 Am- 01 PM). Admit Card for TNTET 2019 will be uploaded soon on Tamil Nadu TRB’s official web portal. Candidates are advised to visit TN TRB official website regularly to know Exam centers and other details. The Syllabus for Paper I and paper will be uploaded soon on TRB web portal www.trb.tn.nic.in. Paper 1 will be conducted for 150 Marks and duration is 150 minutes. Total 150 questions will be given each question having one mark. Paper 2 Also conducted for 150 marks and duration of exam is 2.30 hours. 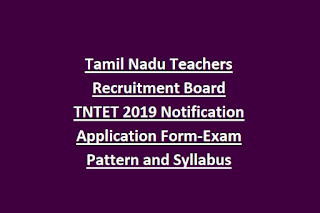 Eligible/ Interested candidates can submit applications form online for this Tamil Nadu Teachers Recruitment Board recruitment 2019. TN TRB’s official website is www.trb.tn.nic.in. Applications process starts from 15-March-2019 to 05-04-2019. For more information regarding this TNTET 2019 logging on to: Website: www.trb.tn.nic.in.